I believe, O Jesus, that thou art the Christ, the Son of the living God. I proclaim my love for the Vicar of Christ on earth. I believe all the sacred truths which the Holy Catholic Church believes and teaches. I promise to give good example by the regular practice of my faith. In honor of His Divine Name, I pledge myself against perjury, blasphemy, profanity, and obscene speech. I pledge my loyalty to the flag of my country, and to the God given principles of freedom, justice, and happiness for which it stands. I pledge my support to all lawful authority, both civil and religious. I dedicate my manhood to the honor of the Sacred Name of Jesus Christ, and beg that He will keep me faithful to these pledges until death. May God bless your resolutions; may His holy angels and saints assist you to keep them. Laboring during your whole life for the glory and honor of the Holy Name of God, may you merit to share in the glory of the apostles, martyrs and confessors, who labored and died for the Name of Jesus Christ. 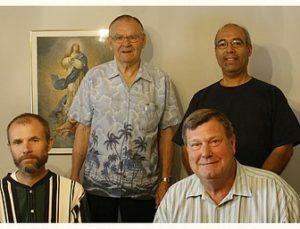 The general purpose of the Holy Name Society is to foster devotion to the Holy Name of Jesus, to honor the name of God, to promote Christian Fellowship among men of the parish and assist in carrying out the work of the parish. The specific purpose, which cannot be emphasized too strongly, is the public veneration of that Name. Most important of these is the spiritual betterment of the individual members and reflection of their better spirituality in their personal and social lives. Giving good examples of family members and those around him, shows he is giving honor to the Name of God. 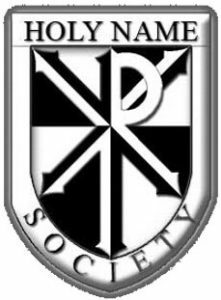 All men of the parish, eighteen years of age and older, are urged to become a member of the Holy Name Society. One Mass is offered each month of the year for the living and deceased members of the Holy Name Society. Sign up in the vestibule before and after all masses during the month of January. Dues are $3.00 for living and $2.00 for deceased members. For $2.00, you may also enroll the forgotten souls. Why Should I be an Active Holy Name Man? Will help me greatly to be regular in the performance of my religious duties, particularly with regard to Confession and Holy Communion. Unites my efforts with those of others in suppressing cursing, blasphemy, perjury, foul language and many attacks on religion and decency. Develops a genuine parish spirit and solidarity which is of untold value and assistance to the Reverend Pastor in carrying out his regular parish program and special projects. Represents the manner most highly approved by the Hierarchy for my participation in the program of Catholic Action, which, in a word, means to learn, to live and to propagate the priceless heritage of my Catholic faith.